The Prairie Band Potawatomi Education Department strives to achieve an increase in leadership qualities through supporting all students in grades K-12 and through the promotion of higher education. We provide financial assistance to students in grades K-12 and we provide scholarship awards and student grants to assist enrolled members with financial resources: to meet higher educational goals; and to increase employment through training opportunities that enhance job skills and/or technical skills. The Education Committee assists the Education department in making recommendations in the implementation of the Education Program and in approving educational grants for students. This Committee is composed of five members with lifetime appointments made by the Tribal Council. Current committee members include: Jason Hale, Adele Wahwassuck, Mary Mitchell, Arlene Wahwasuck and Mary Wilson. The Education Department has six programs designed to meet the educational needs of all tribal members. Policies for all programs are combined into one packet. Click here for Education Program Policies. The Adult Education Program provides student grants for tribal members for assistance with GED preparation and exam fees, registration fees for conferences and/or workshops; tuition when taking only one college course, employment enrichment training/courses, professional licensure fees, continuing education units and other appropriate education activity. Formerly known as the AVT Program, the Job Placement and Training program provides student grants for tribal members to attend vocational technical schools. This includes traditional (9-12 month programs) and non-traditional (less than 9 months) programs. Students attend training in programs such as massage therapy, cosmetology, truck driving school, and traditional vocational training: Computer technology, welding, carpentry, etc. Deadlines are July 1st for Fall semester and November 1st for Spring Semester. The Undergraduate Program provides scholarships to eligible tribal members to work towards and obtain a bachelor’s degree in their chosen field. ** Students attending Haskell or Southwestern Indian Polytechnic Institute are eligible for $2250/semester if living on campus and $3500/semester if living off campus. **Part time students (6-11 credit hours) are eligible for exact cost of tuition, books and fees, not to exceed full time awards. Applications must be submitted and complete by the deadlines to be eligible. The Graduate Program provides scholarships to eligible tribal members to work towards and obtain one master’s degree and one doctorate degree. **Full-time students are eligible for a maximum of $5000 per semester to be used for tuition, fees and books. **Part-time students are eligible for exact costs only, not to exceed $5,000. The program provides financial assistance for school related activities. Eligible students must be an enrolled member of the PBP Nation and enrolled in public, private or home school. Click here for Student Services Application. The mission of the Johnson O’Malley Program is to provide financial assistance to meet the specialized and unique educational needs of eligible Indian children. The J.O.M. program is a federal program and receives a grant through B.I.A.to assist with enrollment fees and basic school supplies. 1. Students must be a member of a federally recognized tribe or provide documentation that they are ¼ total Indian blood. The JOM Committee assists in carrying out the goals and objectives of the Johnson O’Malley program. The primary goal is to provide financial assistance to meet the specialized needs of Indian Children. Current members include Adele Wahwassuck, Josie Pahmahmie, Tina Levier, Chago Hale and Shawnna Wabaunsee. 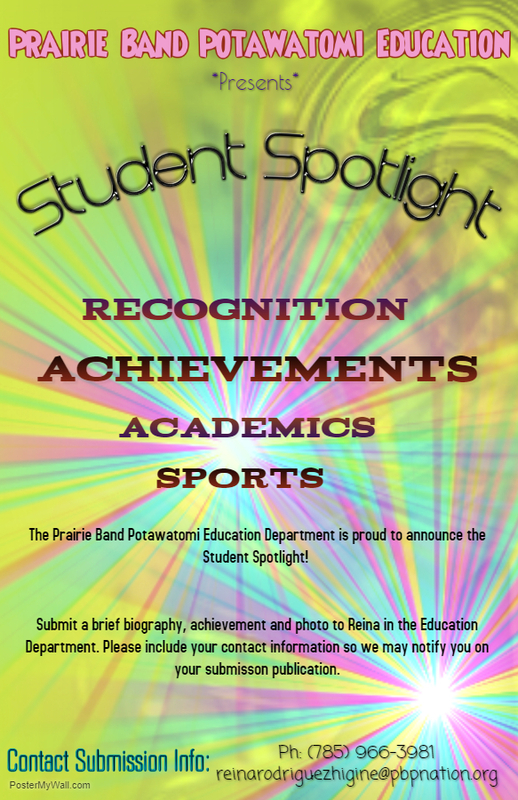 The PBPN Student Spotlight is designed to highlight students achievements. Students can be recognized for significant sports, academics or extracurricular activities with submissions to be published each quarter in the Potawatomi News. Click here for more details! All Students must submit an official transcript after each semester. E-scripts are acceptable and may be sent to transcripts@pbpnation.org. In order to keep all files up to date, our office must have a transcript on file. If you have graduated, please submit an official transcript reflecting your degree. The PBPN Education Department has partnered with several schools to better assist tribal members. The Education department assists Corp First Bank with the handling of forms for Minors Trust disbursements.